Is Customer Service a Part of Your Marketing Budget? 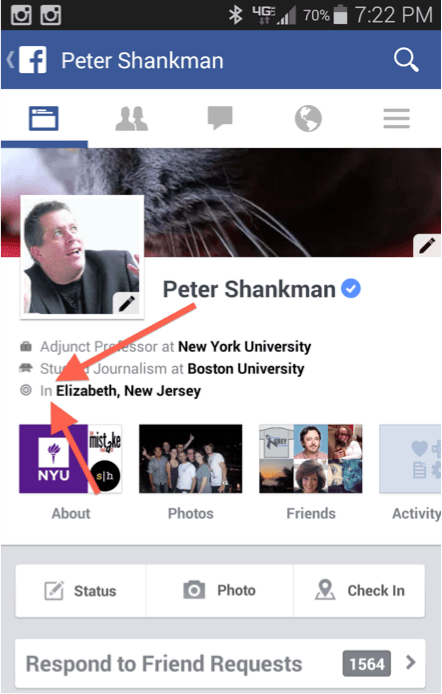 Happen to notice the subtle change Facebook made on mobile last week? No? Here – I’ve highlighted it for you above. Why is this huge? Think about what I’ve been preaching lately in my talk about my new book, Zombie Loyalists. Facebook’s gone real-time, to show the world what you’re doing, where you’re spending your money, and with whom you’re hanging out, and possibly most importantly, whether you’re having a good time. Again, in real-time. Ready for some strategy? After all, this is on Jay’s blog, and his blog is full of strategy. You land in Los Angeles for a conference. You drop your bags off at the hotel, and you’re hungry. It’s dinner time. At the same time, a small window pops up showing a tweet I made about my wonderfully dirty Martini, and how much I liked it, while Jay’s two-minute old photo of our Oyster platter rises to the top of your feed, as well. You post on our wall to save a spot for you, as you’re on your way to join us. But here’s the critical part – If Jay and I were waiting for 40 minutes at Morton’s before getting a table, or if the martini sucked, or the waiter was rude, we simply wouldn’t be the first thing Michelle sees in her feed when she pulls it up. If the sentiment is negative, that interaction will have much less weight assigned to it than if it’s positive. It’s happening already on Google – Type in “Steakhouses” in Maps, and it’ll show you all the steakhouses around you. But at the top will be the steakhouses your friends have visited – if their sentiment was good. See, it won’t be about reviews anymore, and it certainly won’t be about anonymous reviews. Rather, it’ll be about people you trust, in real time, automatically giving you information you need, at the exact second you need it. Imagine the immediacy of Twitter, with the power, knowledge, and marketing smarts of everyone in your Facebook network. Imagine what happens when real time no longer means “send a tweet,” but just be somewhere and people will know your sentiment without you having to do another thing. If you’re a business, and this doesn’t make you rethink customer service entirely, you’re gonna have a bad time. The hell with TripAdvisor’s hotel reviews, and screw Yelp’s restaurant reviews. Should Michelle trust someone she doesn’t know, or should she trust Jay an Peter, her friends? It’s a no-brainer. So what does that mean? It means your marketing budget for your business now needs to have the first line be about customer service. Without customer service, all the ads, paid, or earned media won’t matter at all. Because as soon as Michelle sees that positive sentiment of something that just happened to one of her friends, she becomes a Zombie Loyalist for that business. The future is here, folks. The economy of tomorrow will be powered by Customer Service. The way you treat the customers you currently have will determine whether or not you get the customers you want. Buckle up. It’s going to be a hell of a ride. Peter Shankman is best known for founding Help a Reporter Out, which changed how journalists and sources interact around the world. Zombie Loyalists is his fourth book, and is the follow-up to his best-seller, Nice Companies Finish First. He blogs at Shankman.com.